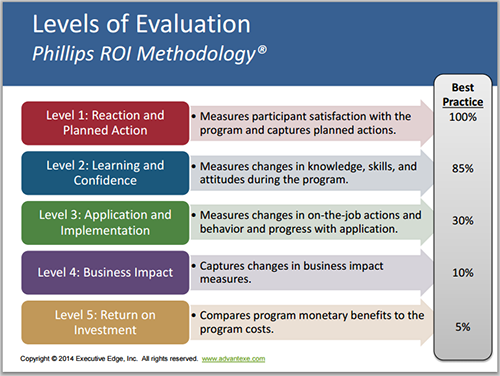 Advantexe believes in confirming and evaluating the impact and value of your training engagement. Advantexe utilizes a number of measurement techniques to quantify the effectiveness of our talent development solutions. We have been certified by the Philips ROI institute and have conducted several major initiatives that illustrate the profound business impacts of our approaches. Advantexe's client, a publicly traded communications company, wanted to provide managers at all levels with the skills and tools they needed to make better business decisions. Advantexe developed a customized solution covering financial management, marketing and strategy and included a business simulation, coaching and action planning work shop. The Results? A 5840% return on the training investment!